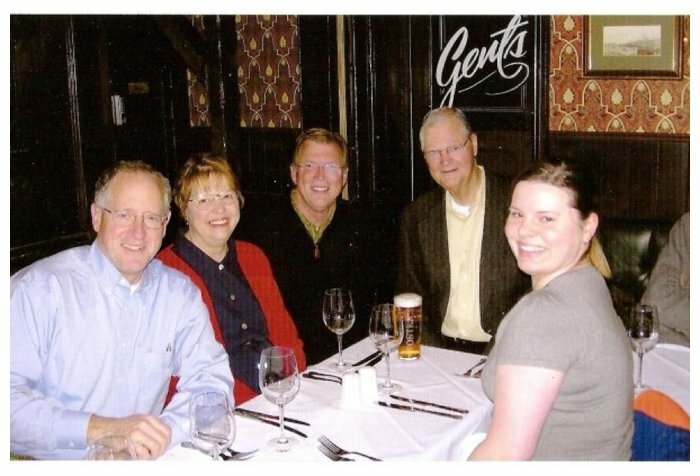 My mom and me in London in 2005 at the Grenadier Pub with Congressman Mike Conaway, Congressman Jon Porter, and Congressman Ike Skelton. After my mother's funeral, several people approached me and said they were surprised I hadn't given the eulogy, that they had liked my eulogy at my father's funeral, and that they would have liked to hear me speak. I don't really remember how I responded. Likely some nonsensical sputterings of "Oh, you know," and "Oh, thank you." The thing of it is, I couldn't give the eulogy at my mother's funeral. First, my father had been dying for some time, and I had been writing his eulogy in my head for a couple of weeks before he died. And while I don't remember a time when my mom was not sick, I didn't see it -- her death -- coming. Second, while I was quite close with both of my parents, I was close with my mother in a different way. Consequently, I didn't know how to step back and string together words about her. But two years have passed. My mother was, first and foremost, an Oklahoman. She was born and raised there, and supremely proud of her Oklahoma heritage. Many of my childhood memories involve road trips -- just the two of us -- to Oklahoma. On those trips she would teach me about the subtle beauty of the Flint Hills, the rich history of the Native Americans and the best shopping in Tulsa's Utica Square. And she would tell me stories about how she and her father would go visit his oil wells every Saturday morning. My mother was the finest writer I know. She was an editor at the Washington Post and of Kansas City magazine, and she taught me everything I know about literature. She taught me about the fatal flaw in Fitzgerald's Tender is the Night, about Faulkner's brilliant Nobel Prize speech, and about the deceptive simplicity of Ivan Turgenev's novellas. And she told me that all I ever needed to do was write one good paragraph. But the thing I admired the most about my mother was her kind heart. When I was young and would get mad at friends, my mom always would say, "Don't be angry with them, feel sad for them." This advice was maddening for a kid in elementary school, but as I've grown older, I realize the wisdom of this advice more and more each day. My mother showed her kindness in many other ways. She created and orchestrated her church's literacy program for underprivileged youth, she wrote checks for a student's tuition at an urban core charter school, and when I stood in the receiving line at her funeral countless mothers came up to tell me a similar story about her. They told me a story of how one of their children had been troubled, how they had worried about their troubled child, and how my mother always believed in the child nonetheless. My mother's favorite story to tell about me had to do with a parent-teacher conference my parents attended when I was in elementary school. In my family, a great deal of importance was placed on achievement and intelligence. When my parents sat down to meet with one of my teachers, the teacher explained how I was, in fact, doing quite well in school, paused and then said, "But most importantly, Anne has a good heart." If only my mother knew how much of that good heart I got from her. I often hear people say that they wish they had said, "I love you," to a deceased loved one or that they had hugged that person before they died, or some such thing. I don't have these wishes. My only wish -- everyday -- is to be able to walk into my mother's office, sit by her desk, and for a couple of minutes -- just be with her. I have made countless pleas, promises and negotiations with God for this to happen. To no avail. And so I remember the words my mother often said to me, "Be brave, Anne. Be brave." well done, Anne. What perfect advice to be brave. Your mom was a wonderful woman--extraordinarily kind, honest and upfront, wise, and very proud of you in the very best way. Even though there are many years between you and I, I can so relate to your wish to have a couple more minutes. Not a day passes when I don't have the same wish to be with my mom. It's the wish that has driven my family blog every day, that reminds me of the importance of saying what's in our hearts to those who are important to us, and that starts each day. Your lovely tribute honors your mom and she continues to have reason to be proud. Your mother was a wonderful and generous woman. She made a difference in my life. I will never forget her support and kindness. I don't know exactly what to say but do appreciate you sharing your thoughts on this blog. I took for granted getting them on a daily basis back in DC. I am also thankful that you are able to write about your mother. Nice picture. Ah, thanks, Kyle. On a lighter note -- whenever Kobe Bryant comes up in conversation, I always laugh to myself about all of our great conversations about him. Maybe I should do a post about HIM! Wonderfully written, your Mom was such an amazing person and so are you! Beautiful post, Anne. Your mother sounds like an amazing woman and I'm sure she is and was so proud of the kind, thoughtful, and brave person you are. Thanks, Missy. Thinking of you. Missy said exactly what I wanted to say in a much more eloquent manner. So I'm just going to say "ditto." This post flows with a gentle rhythm that really locks you in. You are definitely hitting your stride. A pleasure to have known your mom and to be friends with her lovely daughter who I see pay tribute to her parents in so many beautiful ways every day.